In the graphics side, the major differences between ARM and X86 systems is that on ARM 3D acceleration is done with OpenGL ES. It is mostly a subset of modern OpenGL used on X86 desktop machines. From QEMU point of view this could mostly be ignored, as OpenGL was mostly used on games and specialist applications. This has now been changing, as desktops and user interfaces have started OpenGL to render graphics. Without acceleration, these user interfaces become slower than slugs crossing a tarpit. For this reason, MeeGo introduced OpenGL ES acceleration support to QEMU. With the lack of easily available MeeGo QEMU images and test setup, I've created a test setup for Linaro 11.05 image. 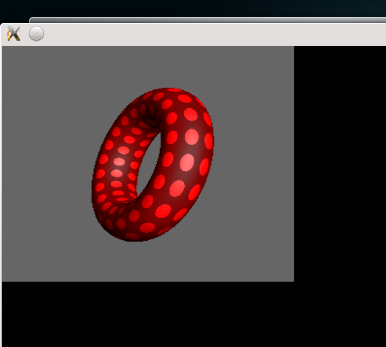 Running torus opengl es1 demo from mesa-demos inside QEMU. Has this support been included in upstream QEMU? The code is not quite good quality enough for proposing to be merged in upstream QEMU.